The 99Ci Cross-Cut Paper Shredder has a 100% Jam Proof System that will eliminate paper jams and powers through tough jobs. 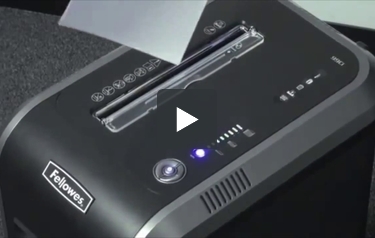 It SafeSense Technology stops shredder when hands touch the paper opening. SilentShred offers ultra-quiet shredder performance for shared workspaces. Additionally, the 99Ci features an energy savings system that provides optimal energy efficiency 100% of the time-in use and out of use. Shreds 18 sheets per pass into 5/32” x 1-1/2” cross-cut particles (Security Level P-4). Maximum run time: 30 on / 40 off. 9 gallon pull-out bin and For 1-3 users. SafeSense Technology stops shredder when hands touch the paper opening. Shreds 18 sheets per pass into 5/32” x 1-1/2” cross-cut particles (Security Level P-4). Maximum run time: 30 on / 40 off. Cut Size (inches):	5/32" x 1-1/2"
I got this shredder a week ago. I completely love it. It's quiet. You can't hear it in the next room and it has a low humming sound. It does everything it supposed to do. Even though it is refurbished, I haven't had any problems with it and I done a lot of shredding since I bought it. It runs like new. I was hesitant about buying it and I look for things to shred. Don't let refurbish scare you off. I highly recommend it. 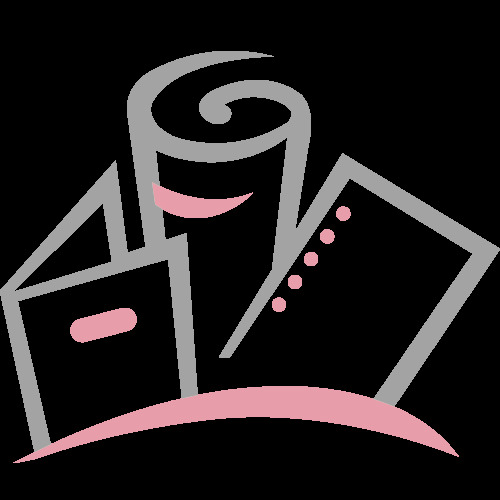 Researched and for the money great paper shredder for home and small business use. Had a fellowes before it for ten years. It was its replacement. Just got the shredder in. Simple and easy set up. I am very pleased with the power and ease of operation. I had a Fellowes DM12C that has served me very well for over 8 years but needed something that was more powerful. This fills the bill. I shopped on line, read reviews, compared brands and settled on this Fellowes 99Ci. I am very happy I did. If this one serves me as well as my first Fellowes I will be a happy camper. We replaced our small shredder with the 99ci. It is quiet, perfect size for a small office. Love that is shreds through papers that are stapled less hassle. Best purchase ever. Would recommend for home or office. I purchased this unit with the hope of reducing the billing from the secure paper removal company we currently use. Wasn't sure if this was the answer. It has certainly exceeded expectations so far. Quiet, efficient operation. Handles 18 sheets of paper effortlessly. Great investment. The Fellowes 99Ci arrived 3 days after I ordered it through Amazon. It had great reviews, but it was a little over my budget. Because I have owned at least 4 shredders in the past, which never lasted more than a year, it was time to bite the bullet and find a good one. I am not disappointed! This shredder surpasses all my expectations and was well worth the money. It was a little taller than I expected but it fits perfectly next to my desk. It is super quiet, the design is one you want to show off and the bells and whistles are outstanding. I know if I'm putting in too many pages by the indicator light and it shows when the basket is getting full. It will even shred small paper clips and staples! I just love this shredder and would recommend it to anyone. This used for my home use. I am so glad I took the leap to the higher end model. I got tired of the constant jamming of my previous model, yes it lasted a long time but this will outlive me. I appreciate the safety features of this model as well. Give this model a second look and if you do your homework as far as price you will be able to be the winner at a great price for a quality product. The shreds are larger than I thought they would be but provide needed security. Never have to open the junk mail anymore it eats it up in one swoop. This product was purchased to replace a Fellowes product that we have used at our office for 5 years without any troubles and we have used everyday. I also use a Fellowes product at home and have had no issues. Welcome to MyBinding video. 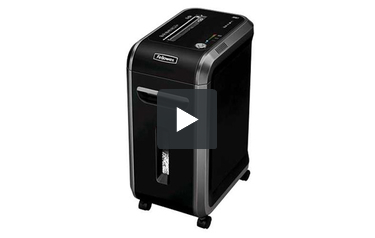 Let's look at the PowerShred 99ci, a cross cut paper shredder by Fellowes. The 99ci is built tough for small offices with a handful of users that need a higher level security shred. The 100% jam-proof system assures that too much paper isn't inserted and powers through extra tough jobs. This shredder also offers silent shred technology, so usage of the shredder won't disturb your coworkers. It's fast and very efficient, able to shred up to seventeen sheets of 20lb paper at a time. It also can handle staples, credit cards, paperclips, CDs, DVDs, and even junk mail. With a flip of this plastic guard, it makes insertion of credit cards and CDs very easy. The 99ci also has Fellowes' SafeSense technology; if your hand gets too close to the opening, the shredder shuts down automatically. Although we're not sure exactly why there is a reverse button on a jam-free system, but there is one. Simply press this left button and your project comes back up out the top and you can reinsert it or start again. The large nine-gallon waste bin is accessed from the front and shreds at a level three security. It can be stationary on the floor or the table and it comes with casters to roll around the office. That's the Fellowes PowerShred 99ci. For more demos, reviews, and how-tos, check out MyBinding.com. Hi, I’m Mitch and this is the 99CI from Fellowes. This 17-sheet cross-cut shredder can shred staples, credit cards, paper clips and CDs, DVDs, and includes a 9-gallon pullout bin and can shred continuously for 25 minutes before cooling down period. The 99CI has several unique features. The patented 100% jam-proof system eliminates jams by preventing the shredder from taking in more paper than it can handle. Simply remove excess paper and resume shredding. The jam-proof system also powers through misfed paper. The light bar will give you visual feedback while you shred. Green to yellow means you’re within the recommended paper capacity, thus, maximizing productivity. The 99CI also features the patented Safe Sense technology which stops shredding when hands get too close. The shredder also includes silent shred performance, making it ideal for desk side use. Again, this is the 99CI from Fellowes – manufacturers of the world’s toughest shredders. Every office needs a paper shredder and Fellowes has some great professional-grade models to choose from. One of these is the IntelliShred SB-99Ci, a multi-user unit that offers great security, terrific design, and a good shredding capacity. Here are the machine’s strengths and weaknesses. The SB-99Ci can shred up to 17 sheets of paper per pass, so it’s ideal for offices that need to shred as much as possible in one go. It can shred up to 12 feet of material in one minute. In addition to unwanted paper, this machine will get rid of staples, paper clips, credit cards, and CD’s and DVD’s. However, it cannot shred other types of electronic media. This machine offers a very good amount of document security because it’s a cross-cut device with a Level 3 security rating. It has the ability to turn a sheet of paper into countless particles that measure 5/32″ x 1-1/2″. The SB-99Ci is perfect for shared workspaces in which 3 or 4 people need to have access to it. This device has a 9-gallon waste compartment that won’t need to be emptied incessantly so you and your employees can keep right on shredding. You will be able to tell when the bin’s getting full thanks to a convenient window and then, when it’s time to empty it, you can pull the bin out like a drawer. This device was designed to not take up a lot of space despite having such a roomy waste compartment. The SB-99Ci is just under 14 inches wide so it can fit right beside a desk, file cabinet, or in between other office machines, such as a photocopier or printer. It’s even equipped with casters so it will be easy to move to your desired location. The SB-99Ci is a SafeSense device that will shut down immediately when a user’s hands are too close to the feed opening. This feature greatly reduces the chances of any injuries occurring. Each unit offers jam-free operation thanks to a visual indicator that will let you know if you’re shredding the right amount of paper or are trying to stuff too many sheets into the device. If you do end up overfeeding the machine, the motor is able to handle it accordingly so you won’t have to resolve a jam. There is a paper holder on one side of the machine so you can store your documents before feeding them into the device. Although this device can shred many sheets at a time, it cannot run continuously. After 20 minutes of use, the machine will need to cool off for 40 minutes, which is obviously twice the length of the running time. This is definitely a weakness. The SB-99Ci lacks a slot for non-paper waste. Also, as mentioned above, it can’t handle all types of electronic media. Finally, the Fellowes IntelliShred SB-99Ci has a great warranty package. The company offers a 2-year service and product warranty and they will cover the cutting mechanism for life. Although this machine has a very long cooling off time, this is really a great product for shared workspaces that require a shredder with first-rate safety features and a good security rating. I need a machine that can be used for years. Is the SB-99Ci the one for me? Definitely. That’s because this is a Fellowes product and the company is well-known for making high-quality machines that are durable and can withstand a lot of use. The SB-99Ci is also backed by a great warranty. Not only are parts and service covered for two years, the cutting head will be under warranty for as long as you own the device. What kind of safety features does this shredder have? Like many Fellowes’ shredders, the SB-99Ci has a feature called SafeSense. What this does is detect body parts that are too close to the device’s paper opening. When that happens, SafeSense will make the machine turn off so the user can keep his/her fingers. How often will this machine jam up? The SB-99Ci is one of Fellowes jam-proof products so the odds of you experiencing a paper jam are just about negligible. In addition to having a reverse mode and overfeed indicator, this machine is able to shred its way through excess and misfed paper for awesome jam-free performance. How many people can use this product? This device is great for use by up to about 4 people in a shared work area. It has a 9-gallon waste bin so it can store a lot of waste. Also, the bin is very easy to empty. All you need to do is pull it out like you would a drawer and get rid of your shreds. Plus, this unit was designed to easily slide into tight spaces (it is about 14 inches wide and has casters), so finding the right spot for it should be a snap. Finally, this machine operates quietly so everyone will still be able to focus on his/her work. I really need a machine that will give me a high level of security because I’m worried about identity theft. Can the SB-99Ci do that? Absolutely. This is a cross-cut device that is able to turn a sheet of paper into so many tiny particles you never be able to count them all. This gives the device a Level 3 security rating, which is fantastic. If you need to shred company e-mails, old tax documents, credit reports, or even your own personal bank statements, this machine can definitely help protect you from identity thieves and would-be fraudsters. Can I shred other items, such as credit cards? Yes! This machine is totally able to work with credit cards, as well as CD’s and DVD’s. If you feel like leaving staples and paper clips attached to your documents, go right ahead because this device’s blades can handle those as well. How much can I shred at once? The SB-99Ci is the machine to get if you would like to shred as many sheets as possible per pass. It can accept up to 17 sheets at once and it can run continuously for up to 20 minutes before needing a breather.